There are literally millions of apps out there for Android, iOS, Mac, Windows, Chrome, Firefox, Facebook,web apps, etc. How do you find what you want or need for the platform you are using? Quixey is the answer. 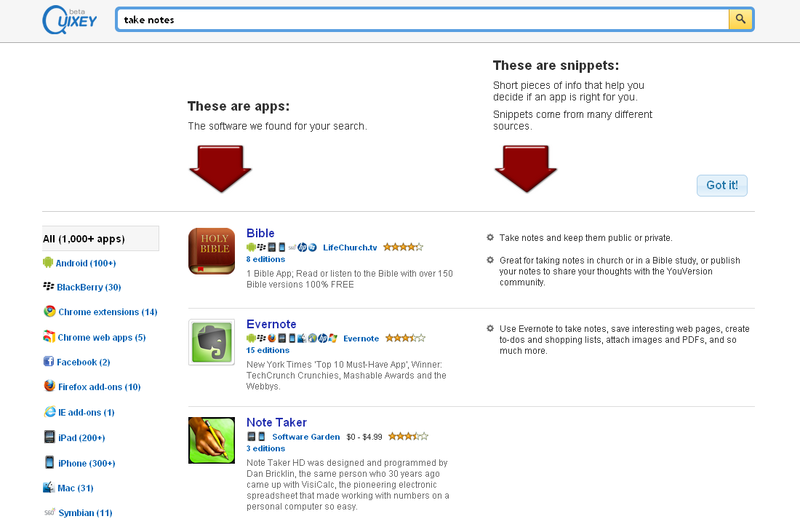 It is a search engine for finding apps. You enter a search for what you want to do, such as "take notes", "record messages", "detect lies", etc. and then it brings you back results. The results are listed with the app logo, logos for what platforms it's available on, and a short description of the app. 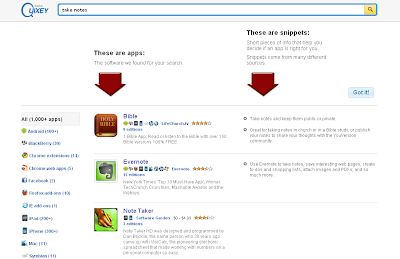 You can also click on the platform links on the left to narrow your search by platform. Under each app name is a link with the number of editions. Click on that and it opens up with a list of each platform, cost, link to the app, and user review ranking. This is a great tool for educators and students to use when looking for apps. Enter what you want to do, and your are off. The sorting by platform makes it very useful, especially if you are looking for apps that work on more than one platform.